We spent the last weekend playing with Legos from Chad's childhood. He collected the castle series and had quite a variety of sets. He has a few castles, two Forestmen sets, and also some wolf pack sets. The figures were the most fun for the kids. Kiwi loved making unique guys she could claim as her own. There was even a Forest lady for her to play with. Here we are setting up for the final battle at the end. Mr. S spent most of the time trying to eat Legos. Luckily nothing went down. G-man cried as we put things away. Poor kids gets a bit obsessed sometimes. To top off the event, Monday night was spent putting away the sets. This included a lot of cursing from Chad as he tried to locate the pieces that had been stranded around the house during the three days of play (honestly I don't know what he expected). I think this may not happen again for a LONG time. Perhaps its because I'm getting close to 30, or maybe because I've reconnected with friends from my childhood era. Maybe its simply because my 10 year reunion is set to occur next month. Whatever the reason, I've been reminiscing about my childhood. Now I can't keep this to myself, so I had to get my kids involved. Which we have been doing by making toys out of trash. When I was in elementary school, probably around 8 or so, I made my own doll house out of cardboard boxes with furniture made out of tissue paper. I even cut up an old shirt for blankets and dyed them different colors. It wasn't entirely because we were poor. I had two Sylvanian families and only one house. It felt selfish to ask for another house, so I improvised. Does anyone remember these things? I had the Slydale family and the Evergreen family. I even had some teenagers and grandparents for the bears, plus two kids and two babies. I would run a whole lifecycle with these my bears. It would start with the two adult bears and they'd get married and have kids and I'd keep running the story until they were old. I want to say I even had funerals for them, but I really can't remember. Anywho, the Slydales needed a house so I built one with cardboard and packaging tape. I spray painted the outside blue and the inside white. I remember getting into trouble for using too many cotton balls and tissues for the beds and spilling some dye on the carpet. This is what I'm doing with my kids. We have beds, a table, a couch, a TV and pictures for the walls. As soon as I finish up the eggs, we'll make a toilet. I think I'm having way more fun than the kids. Just as a side note, don't look at the Sylvanian family website too long. Before you know it you'll be buying a house and furniture and a family to go with it. I think the Moose family is adorable. Or maybe its just me who really really really wants to buy this for me ... I mean ... my daughter. We finally got the walls all textured and painted. The kids have been asking to get the rug back into the room so they can play in it better. They were so excited, in fact, that they built a fort on the rug (with a little help from me). 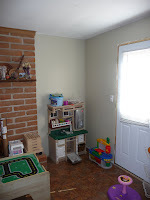 The new wall coloring makes the room look like the rest of the house, and without the faux wood paneling, the project has an anti-climactic feel to it. What can be better than having a day off? A day off of home projects! 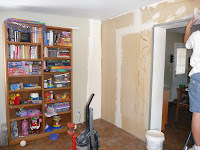 We were hard at work on the playroom this weekend, and made a significant amount of progress. 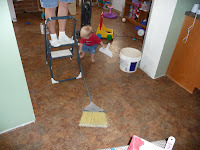 We even got the older two kids helping to prime the walls, and Mr. S helped by keeping the floor clean. 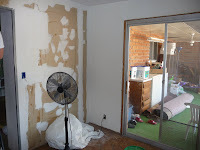 As of now, we actually have paint on one wall, and it is starting to look like a normal room. So much work just to get it blend into the overall house. And just to make it fun, we still have a whole week worth's of work to do. We were talking about how much work we got done, and we came to the conclusion that since only one of us was working at a time, we didn't do much more than we can in the evenings when the kids are asleep.